The international brand name of this medicine is Harvoni that provides effective treatment in Hepatitis C Genotype 1 with a cure rate ranging between 94% to 99%. 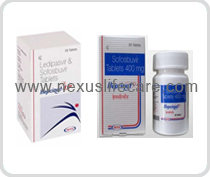 Hepcinat-LP helps prevent Hepatitis C Virus infection from multiplying in your body by weakening the virus and inhibiting its reproduction and replication. Side effects :- 1. Headache 2. Tired feeling. 3. Lower back pain.